In his first public rally to campaign for the BJP, Prime Minister Narendra Modi used Congress president Rahul Gandhi’s tweet “EKAurJhoot” — which ridiculed the Centre's claim that all Indian villages had been electrified — to swing public discourse by unleashing a new naamdaar versus kaamdaar (someone identified by lineage versus someone identified for work done) debate. Modi, at his sarcastic best, accepted Rahul’s challenge of a 15-minute debate in Parliament but also threw the Congress president a counter-challenge: For him to speak at his election rallies for 15 minutes about the Congress government's achievements in Karnataka (in any language he desires: Hindi, English, or even Sonia's mother tongue Italian) without referring to a piece of paper and pronounce the name of M Visvesvaraya five times. In April, Rajya Sabha MP Rajeev Chandrashekar posted a clip purportedly showing Rahul mispronouncing Visvesvaraya's name after which the BJP's state unit posted a comic mocking the Gandhi scion. Modi knows if he can ignite passions of ordinary people against political royalty — for example Rahul and rest of Congress leadership in Karnataka and elsewhere — he would change electoral outcome. There was no better way for the prime minister to use his own government's claim of providing the most basic of civic amenities: Electricity to all villages in India, which had been living in darkness even after 70 years of independence. It’s possible that not all villages in hinterland have been electrified: Electricity poles might have been put up, but wires may be missing, poles and wires may not have been put up at all, or both have been put up. However, now the government claim is open to public scrutiny, something which will ultimately force the government to back up its claim. 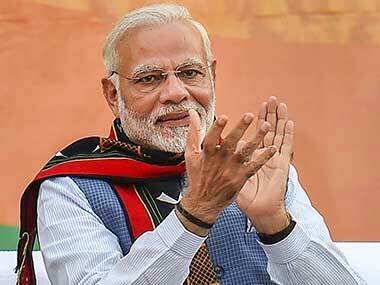 It’s a new beginning and Modi surely intends for his party to bask in its glory and secure electoral gains. In upcoming 12 May Karnataka polls, the BJP is attempting to oust the Congress. It was thus only natural that for Modi to directly aim at Rahul and Chief Minister Siddaramaiah. “Congress and its new president, in their over enthusiasm to criticise us, break boundaries of decency. It would have been better if he had said two encouraging words for my labour class, who, in most difficult circumstances, carrying transformers and poles on their shoulders completed rural electrification task… lekin woh naamdaar hain kaamdaar ki parvah nahi kar sakte”. Modi added that people should thus not have any such expectations from Rahul. Modi then played both the victim and hero card. “I want to ask to those people who abuse us day in and day out, keep on talking nonsense as to why even after 70 years of independence why poor people in rural areas were forced to live an 18th Century life, in darkness without an electric bulb”.